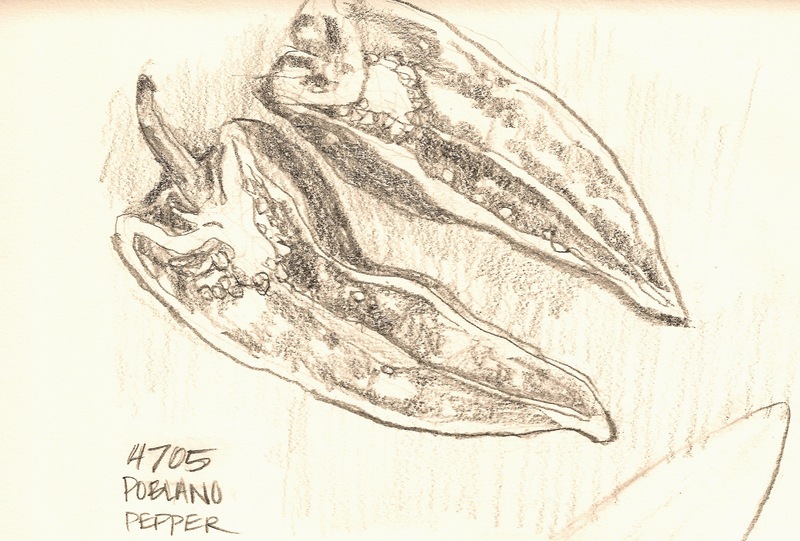 Poblano peppers are something I had never cooked with, or made drawings of, until yesterday. I discovered that poblanos are a lot of fun to draw. Weird bulges and convoluted shapes. Wrinkles and shadows and shiny reflections. The pepper here has been halved but not seeded yet. Last night I cooked a recipe I heard discussed on NPR on the America’s Test Kitchen show. The recipe is for skillet chicken fajitas, with rajas con crema. I love tacos, and this sounded so good on the radio I just had to try it. The poblanos get broiled and sliced and cooked with onions, spices, and heavy cream. That mixture then tops the fajita chicken on tortillas. They tasted so good. Ridiculously good! I think this will be my favorite thing to cook for a while. Are you interested in trying the recipe? America’s Test Kitchen does a 14 day free trial to their website. In my opinion this one recipe is worth the effort of setting up a trial account. I love tacos.